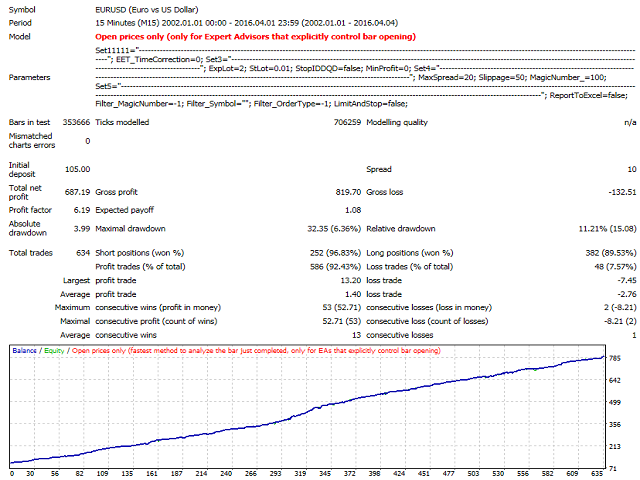 Expert Advisor for the EURUSD currency pair and the M15 timeframe. The development was based primarily on the signals from the MQL5 site. A very successful symbiosis of the technical analysis of the daily charts and mathematics. The chart analysis uses original powerful adaptive indicators. There is a free version of the robot. Real account monitoring Built-in Excel reports. The EA analyses patterns on the daily chart and enters using a pending order. In case of unfavorable movement the position is averaged. The limit orders to elimination the slippage factor. Stability and absence of long-term drawdowns. Powerful management of the open positions. Works without reoptimization on the entire history. Guide on setting the parameters and FAQ. EET_TimeCorrection - difference of the terminal time and EET. NGrid - number of orders in the grid. ExpLot - lot multiplier for subsequent orders in the series. StLot - lot size of the first order. If the value is positive, it is used as a fixed lot (Example: Lot = 0.01 the trade will be opened with the size of 0.01 lot). If the value is negative - the EA opens 0.01 lot per each parameter value available on the deposit (Example Lot = -100, the account has $500, the trade will be opened with the size of 0.05 lot). StopIDDQD - disable opening new series, the current series will be continued. MinProfit - if an order series is opened, the EA will not close it until gaining profit greater than this parameter. GameMode - trades are opened every day regardless of the patterns. Attention! - large drawdowns, unpredictable result. MagicNumber - beginning of the range of magic numbers occupied by the Expert Advisor. The EA occupies 50 numbers. More than month of using on 4 types accounts (LMAX, ICMarkets, AdmiralMarkets, Tickmill). Very good results and stable profit. I reccomend to don't use default settings. 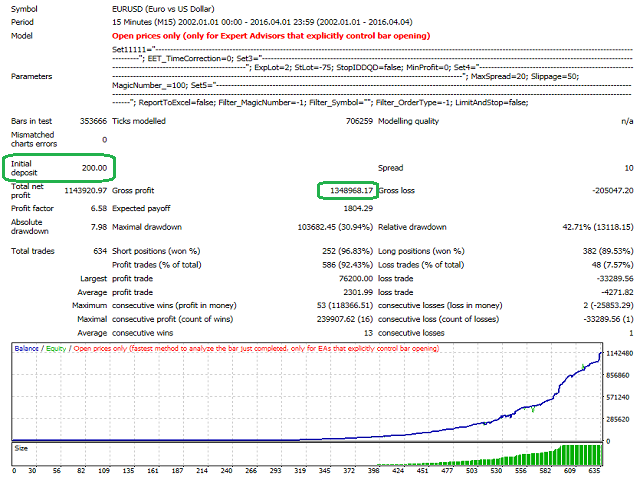 For low risk and stable profit my recommendation is set StLot = -350, GameMode = True. Those are my settings and it work on real accounts, it can be also backtested without drawdown or clearing account to 0. Fixed frequent reshuffling of orders.